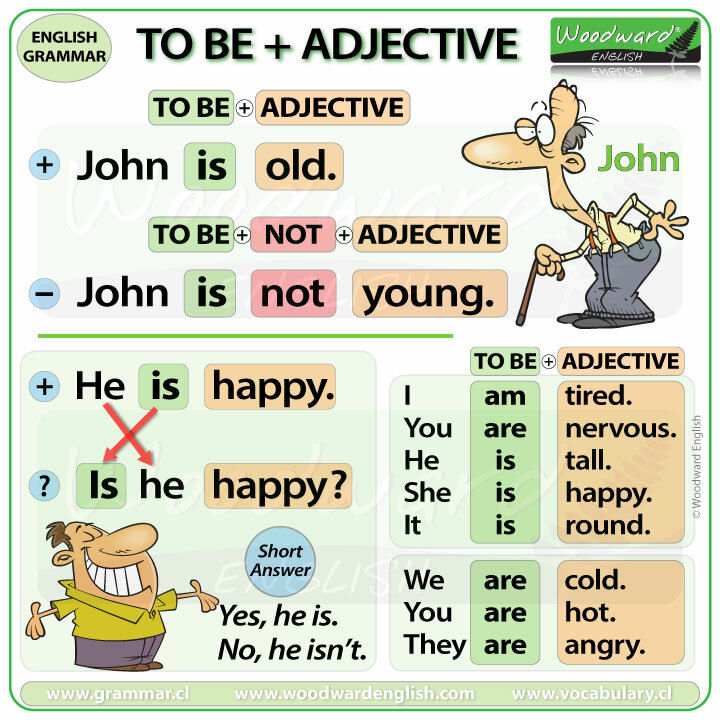 An adjective is a word that gives us a description about something or someone. Old is an adjective. Old is a description of John. What is the opposite of old? Our examples from before … now in negative form. So, the negative sentence is: TO BE + NOT + ADJECTIVE. Let’s look at negative sentences using opposites. I am not sad. I am happy. Flowers aren’t ugly. They are beautiful. Ice cream isn’t hot. It is cold. Lemons aren’t sweet. They are sour. This exercise isn’t difficult. It is easy. A piano isn’t light. It is heavy. Elephants aren’t small. They are big. My shoes aren’t clean. They are dirty. We can also make questions with To Be and an adjective. Instead of he is… it becomes Is he….? Yes, he is. OR No, he isn’t. Yes, she is. OR No, she isn’t. Yes, they are. OR No, they aren’t. Complete these sentences using: is, isn’t, are, or aren’t. 1. The Earth _____ round. 4. A balloon _____ heavy. 7. A rose _____ ugly. Now write the opposite of each sentence. Use TO BE + Adjective. For example: 1. The Earth is round. The Earth isn’t square. Is your city large or small? Is your city old or modern? Is your city clean or dirty? Is your city dangerous or safe? Is your city boring or interesting? Tell us more about your city. Try our English Quiz about To Be + Adjective.